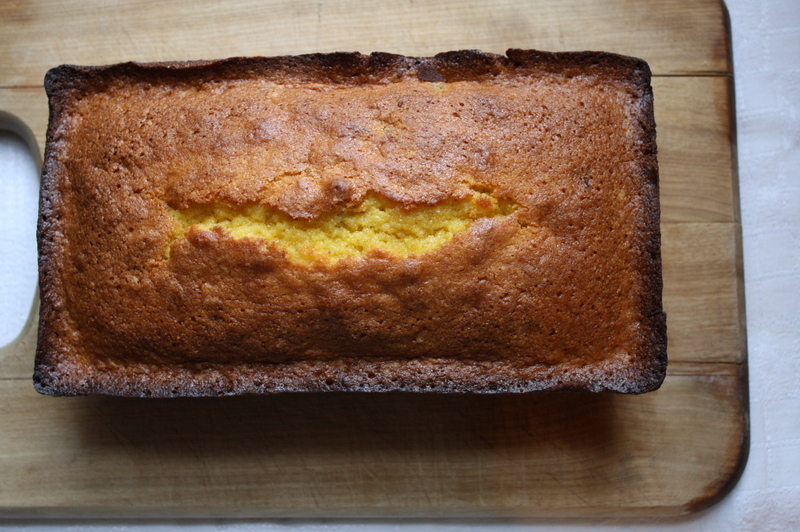 I’ve wanted to make a cornmeal-based cake for a while, with my eye on one made with olive oil. But this cake, featured in our local newspaper’s Taste section, looked good and was just what was needed to get me in gear. We really enjoyed it for breakfast with tea and coffee, feeling that tea was the better complement. I also toasted and buttered a slice the second day – delish! 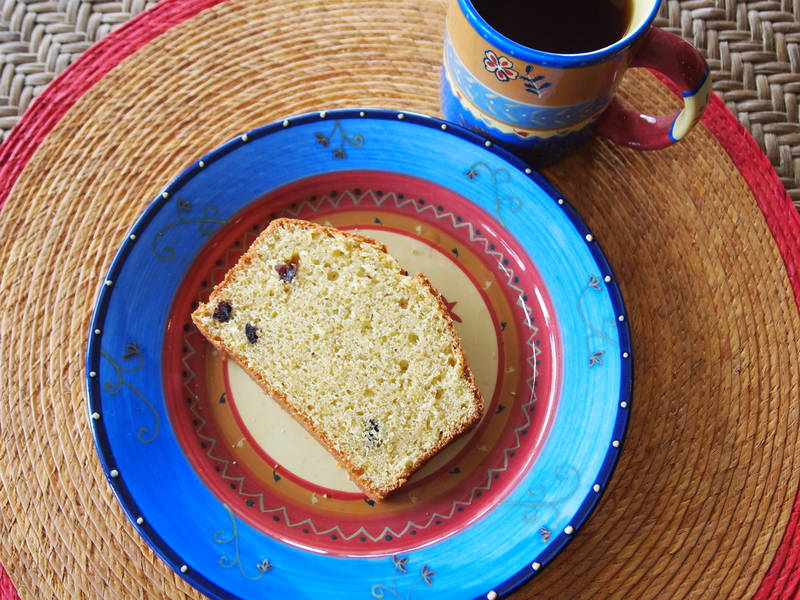 One of the things we really liked about this cake is that it’s not very sweet, making it perfect for breakfast. The original recipe suggested berries and/or whipped cream when serving the cake as a dessert. 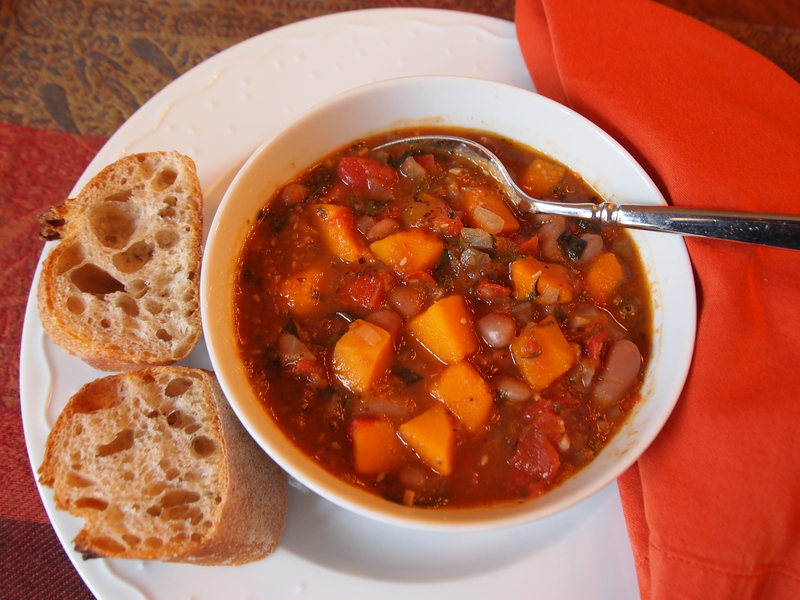 I’m really glad Aunt Suzy shared this recipe with me! I made it for our Saturday morning breakfast (baked the night before), and it was really fantastic with our over-easy eggs and yogurt with strawberries. 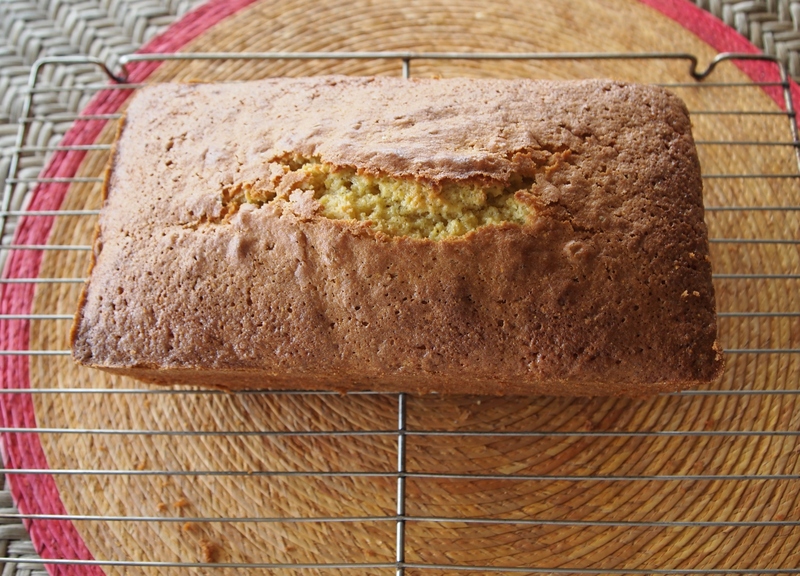 I love the orange flavor and the texture the corn meal gives to the cake. My son pointed out that it would also be good with frosting (of course), and I agree, as a dessert it would be great with an orange glaze (2 tbsp fresh orange juice, 1 cup powdered sugar, 1 tbsp orange zest). Preheat the oven to 350 degrees. Butter or grease a 5 x 9-inch loaf pan. Whisk together the flour, cornmeal, baking powder and salt in a medium bowl. Set aside. In a large bowl, beat together the butter and sugar with an electric mixer until very light and fluffy. Next, beat in the egg yolks one at a time, continuing to mix at high speed until light and fluffy. 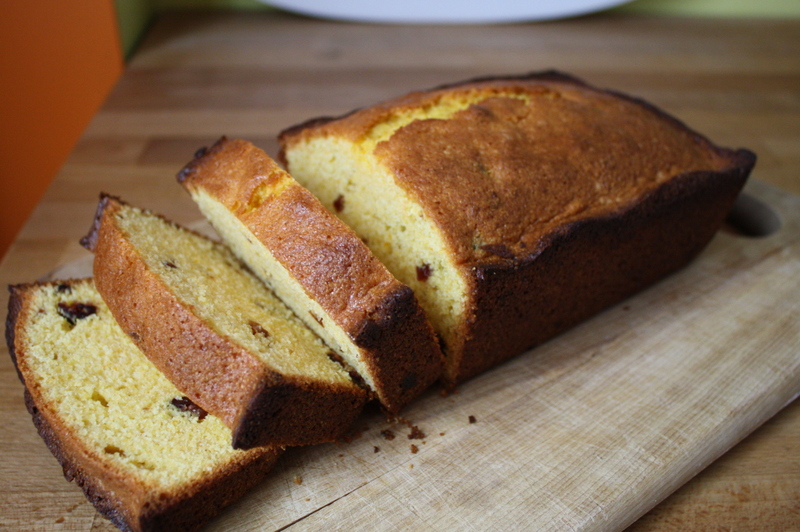 Beat in the vanilla, orange rind and orange juice and dried cranberries. Gently fold the dry ingredients into the butter mixture and stir until combined. In a separate bowl, beat the egg whites until soft peaks form. Gently fold the egg whites into the batter using a spatula until combined. Scoop into the prepared pan and bake until a toothpick or cake tester inserted in the center comes out clean. This will take 1 to 1 1/4 hours depending on your oven. When done, remove and allow to cool in the pan. Remove from the pan and turn the cake right side up. Cool completely before slicing. AS COOK’S NOTES: The original recipe called for 1/4 cup dried cranberries, but each slice had only 2-3 pieces per! We’ve increased the amount of cranberries to 1/2 cup – they provide a nice contrast in taste and texture to the cake. 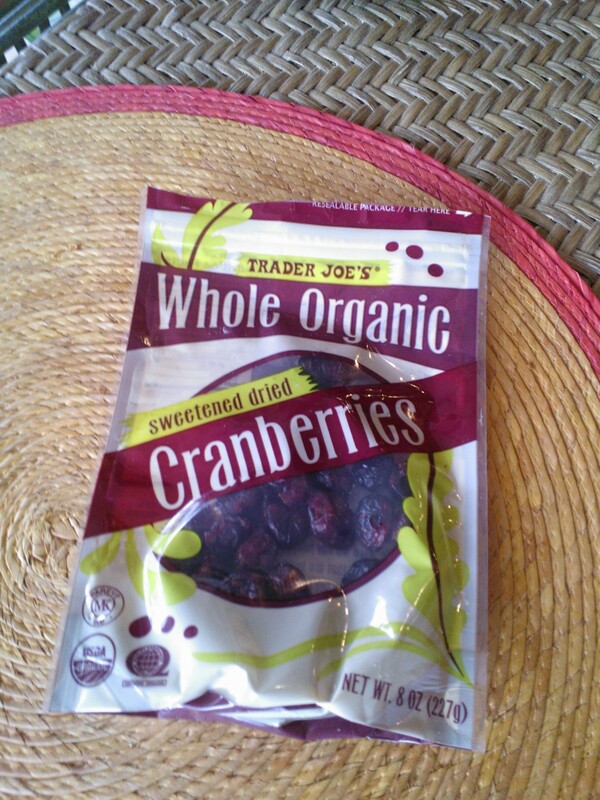 I used the organic dried cranberries from Trader Joe’s, which are large, round and plump. 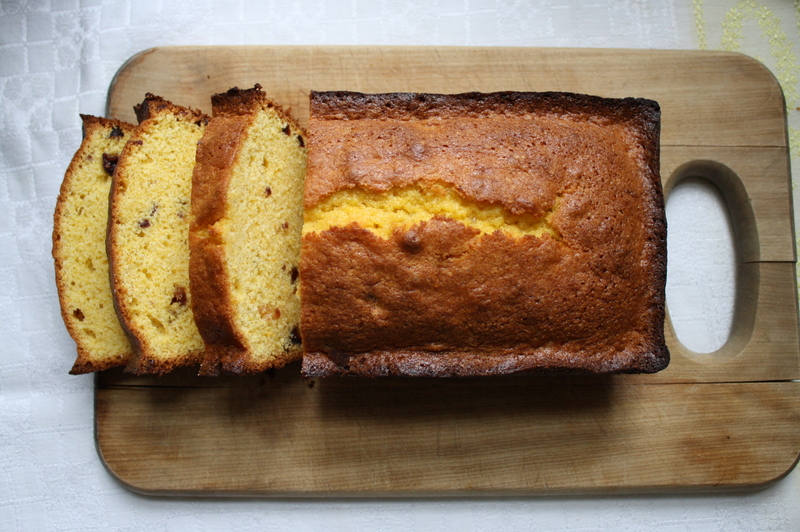 The baking time was specified at 1 hour 15 minutes, but I was glad I checked at 65 minutes, because the cake was definitely done – maybe slight too done! I recommend setting a timer for 1 hour and checking from there until done. M COOK’S NOTES: I agree about the baking time…I checked it at 55 minutes and found mine to be too done, too…It probably could have come out at 52 minutes. I would actually recommend starting to check at 50 minutes.